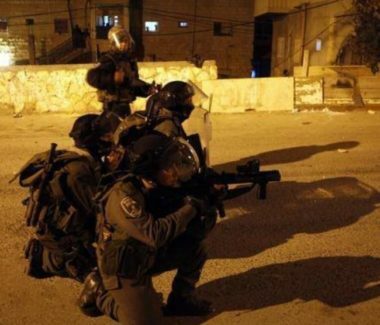 Several armored Israeli military jeeps invaded, on Monday evening, Zabbouba village, west of the northern West Bank city of Jenin, and attacked Palestinians protesting the invasion, causing many to suffer the effects of teargas inhalation. Media sources in the village said dozens of soldiers invaded the village from several directions, and fired gas bombs, concussion grenades and rubber-coated steel bullets at protesters, and surrounding homes. The soldiers also chased many Palestinian youngsters, but were unable to abduct any of them. In related news, the soldiers installed roadblocks near the village, and the surrounding communities, before stopping and searching dozens of cars, and interrogated many Palestinians while inspecting their ID cards.